Due to Wilmington’s proximity to the Atlantic Ocean it is normal for this area to be hit by tropical cyclones. About 40% of the annual rainfall is delivered from July to September, and it is not uncommon during this time for Wilmington to get 7 inches of rain per month. All of this rain puts pressure onto the walls and floors of your business’ foundation and can cause cracking in your walls, bowing walls, or a sinking foundation. These are easily fixable problems, and Atlas Piers can help with all of them. No matter what your problem may be, Atlas Piers can help your commercial foundation repair Wilmington North Carolina be carried out. If you notice any of these signs there’s no reason to worry, as long as you don’t ignore them. Atlas Piers will do the foundation repair in Wilmington, NC. Don’t hesitate to pick up the phone and give us a call. Our qualified staff would like to meet with your and create the design that will provide you with a foundation solution. Helical piers and steel push piers are products that can provide you with the much needed strength and stability to lift your foundation back up to the recommended elevation. If you are seeing bowing wall or leaning walls, we might suggest the addition of carbon fiber sheeting. The carbon fiber is another way to add strength to a wall that has failed to keep its original design. Once on the wall, you can add top layers to make it fit in with your own decor. There is no reason to wait on foundation repairs. Your business is a big investment, and Atlas Piers plans on helping you keep its foundation in great shape. This will keep the value of your commercial building up and your employees safe and sound. Foundation repair in Wilmington, NC is worth the investment. In addition to helical piers and carbon fiber repairs, Atlas Piers offers several other foundation repair solutions. 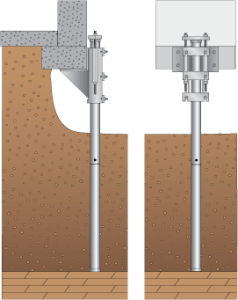 For foundation underpinning, we offer several types of piers besides helical piers and steel push piers. These include: micropiles, new construction piers, and slab piers. We also offer helical tieback installation. Helical tiebacks are used to straighten bowing or leaning foundation walls. These tiebacks are anchored into the ground adjacent to the affected wall. Next, they apply a horizontal force that is equal and opposite to the direction of the lean. Pressure grouting is another services that Atlas Piers specializes in. If erosion or soil shrinkage lead to the shifting of soils beneath your foundation, voids can form. Pressure grouting is a method by which grout is injected beneath the foundation to fill these voids. This stabilizes the foundation and gives it the support that it requires to remain structurally sound. We are also experts in wall encapsulation. This is a process that involves installing a vapor barrier around the walls of a crawlspace or basement. This vapor barrier seals out moisture to keep the area dry. Not only does it keep the area dry, however, but it also keeps he air in the entire structure cleaner, which in turn keeps both you and your customers healthier. So no matter what solution is needed to keep your foundation up-to-date, we can provide it. We’re a simple call away, and we’ll help in any way we can. No matter what, we have you covered. Call Atlas Piers of Atlanta, your provider of foundation repair in Wilmington North Carolina.